A block is given a short push and then slides with constant friction across a horizontal floor. Which statement best explains the direction of the force that friction applies on the moving block? Friction will be in the same direction as the block's motion because molecular interactions between the block and the floor will deform the block in the direction of motion. Friction will be in the same direction as the block's motion because thermal energy generated at the interface between the block and the floor adds kinetic energy to the block. Friction will be in the opposite direction of the block's motion because molecular interactions between the block and the floor will deform the block in the opposite direction of motion. Friction will be in the opposite direction of the block's motion because thermal energy generated at the interface between the block and the floor converts some of the block's kinetic energy to potential energy. Note that (d) can be excluded since energy is a scalar quantity, in which case it's conversion from kinetic to thermal can say nothing about the direction of the friction force. This is College Physics Answers with Shaun Dychko. 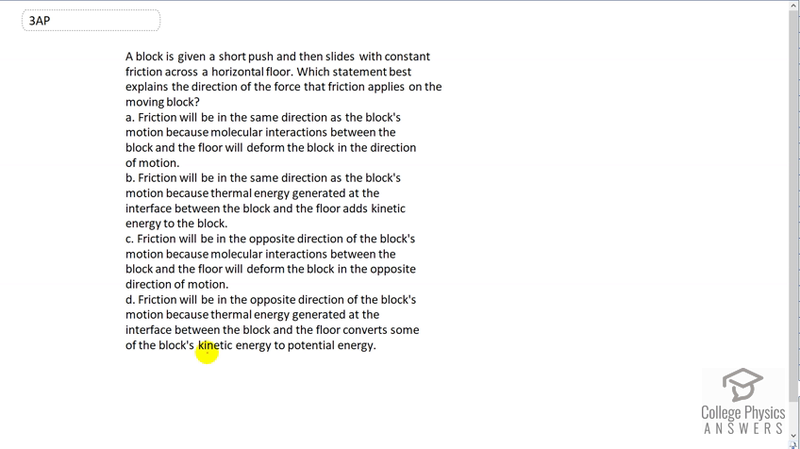 So a block is given a short push and then slides with constant friction across a horizontal floor and we have to figure out which statement best describes the direction of the force that friction applies on the moving block. Now it’s pretty clear that friction is in the opposite direction to the block’s motion and that’s why the block eventually stops. So a and b are fairly straight forward to exclude because they both claim that friction is in the same direction as the block’s motion and if that were true, the block would speed up which we don’t see, we see it slow down. Friction is an opposing motion, so a and b are not true. Choosing between c and d is actually slightly a bit tricky I think, because d has some truthiness to it, it’s kind of true but not as true as c is. C is the answer but let’s look at d for a second. It’s true that some of the block’s kinetic energy is converted into thermal energy, that’s true. But that’s not really what this is saying, the wording of this is suggesting that that conversion is responsible for the direction of the friction. And this conversion of kinetic energy into thermal energy says nothing about the direction of the force of friction and so d is not correct. But c is the answer. There are interactions on the molecular level that caused the floor to continually scrape the block in the direction that opposes its motion. There we go, the answer is c.